If you must go out at night, make sure your costume is light in color or reflective. Carry a flashlight so you can see and be seen easily. A facemask will keep you from seeing well. take off your mask before crossing the street at the crosswalk. Consider using make up instead of wearing a mask. 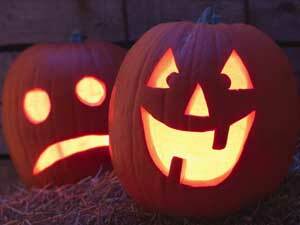 Have a parent or older brother or sister go trick-or-treating with you. Plan your Trick-or-treat route ahead of time. Pick streets THAT are well-lighted. Cross only at corners or crosswalks; never cross between parked cars or in the middle of the block. Wait until you get home to sort, check and eat your treats.